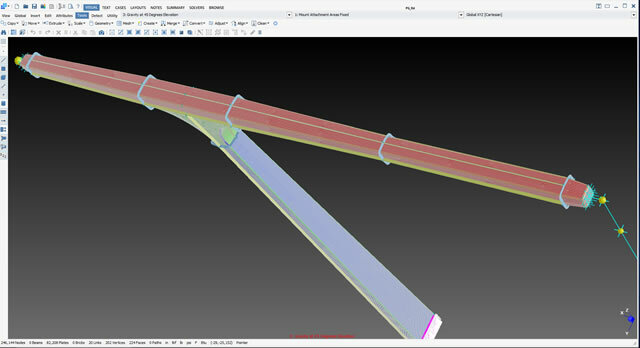 BCT's primary CAD (Computer-Aided Design) program is Rhino3D. 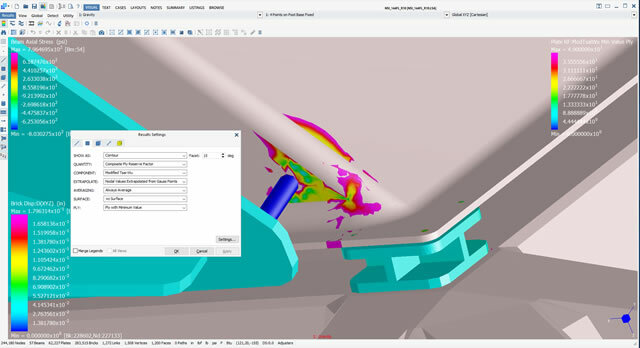 Rhino is used because of its unparalleled ability to precisely model surfaces and because BCT doesn't require the ability of a CAD program to handle complex assemblies. 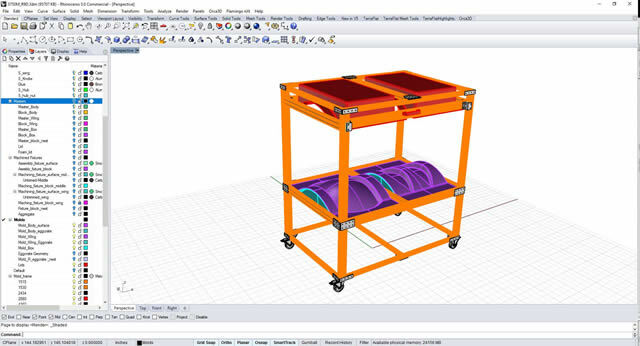 Rhino also has the ability to import almost all other CAD formats that a customer may provide. 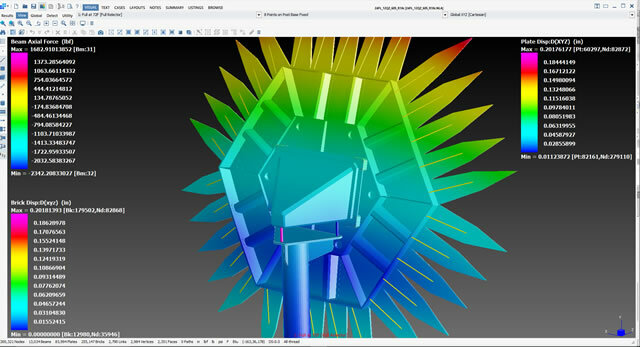 It is the CAD modeling that provides the input for both FEA and CAM programs. By the use of the Finite Element Analysis (FEA) program, Strand7, BCT creates the laminate schedules for composite structures to meet structural and performance requirements. It is used to rapidly and accurately investigate the qualities of different geometrical structures and laminate orientations, giving BCT the opportunity to refine and adjust them until an optimal solution is reached. 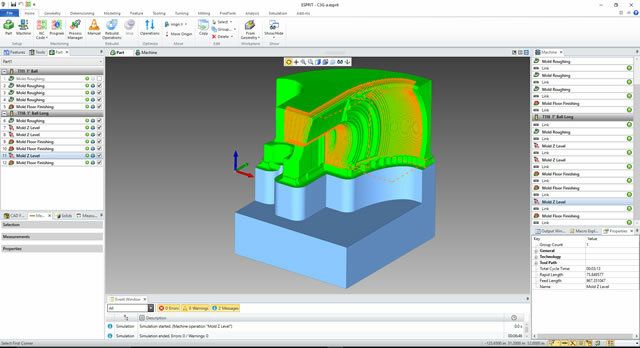 Strand7 also has a free downloadable viewer so the customer can review the FEA model and its results. 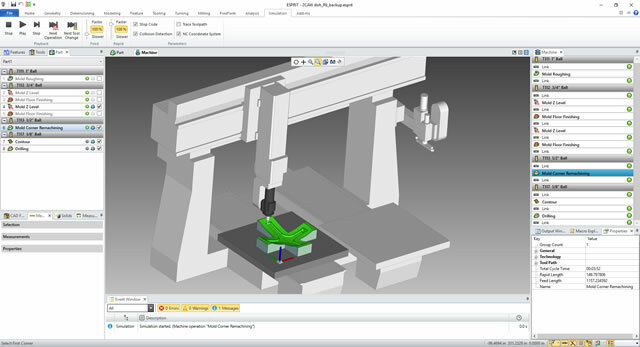 BCT utilizes Esprit as its Computer-Aided Machining (CAM) system to program its 3 and 5-axis CNC routers. HIgh-end CAM reduces manufacturing lead times, eliminates the risk of programming errors and dramatically improves overall productivity. 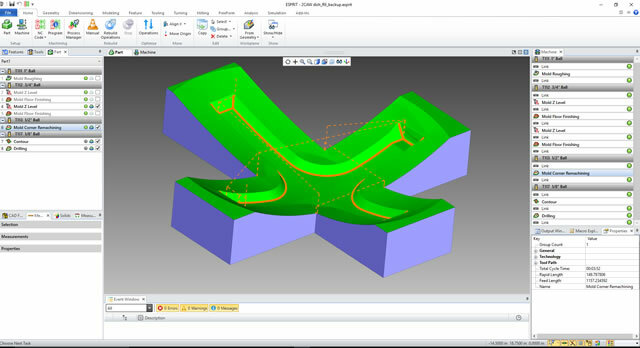 CAM develops tool paths to mill any particular solid object from computer generated 3D CAD models. This path enables the cutting of various complex forms such as the milling of masters, machining of cores, or trimming of finishing of panels and parts. 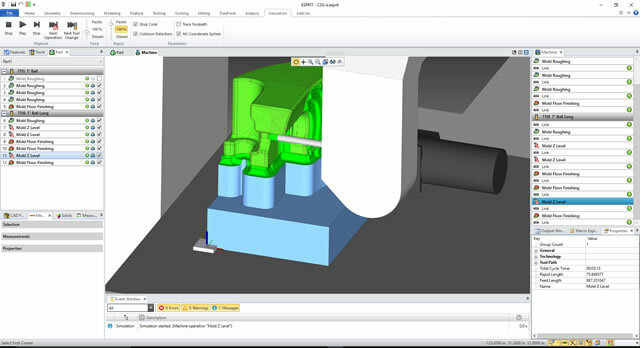 BCT uses high-performance Esprit CAM software because of its ability to handle advanced machining applications while maintaining comprehensive tool control, helping make the most accurate parts for BCT customers. 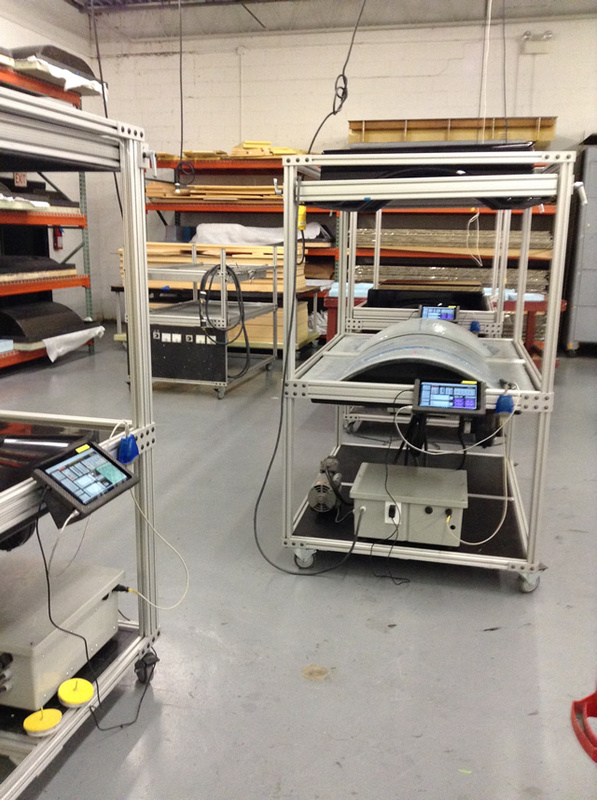 BCT uses Spatial Analyzer to interface with its Faro Quantum tracking laser and a Romer scanning arm. Metrology is used to attain precision in final fairing process of both tooling and parts and also in final part verification. It is also used for machine calibration. BCT has been writing process control applications and algorithms for 25 years. 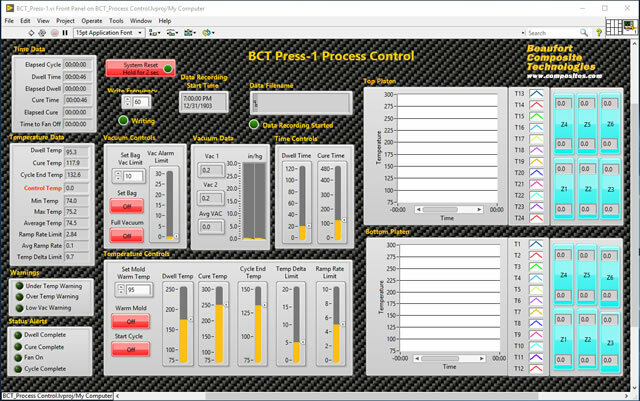 For many years, BCT wrote its code with Labtech, but recently switched to LabView for all its data acquisition and control code writing . 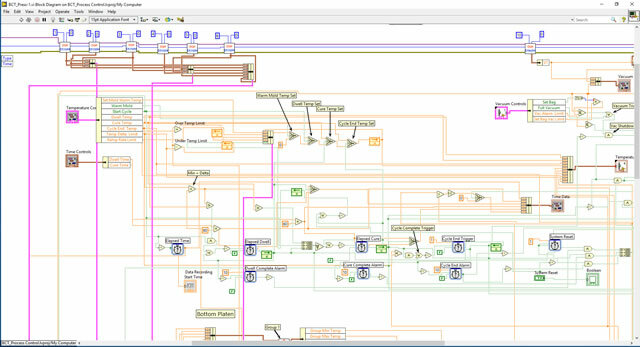 The nice thing about LabView is that after a program with its GUI has been created, a self-executable application is compiled. 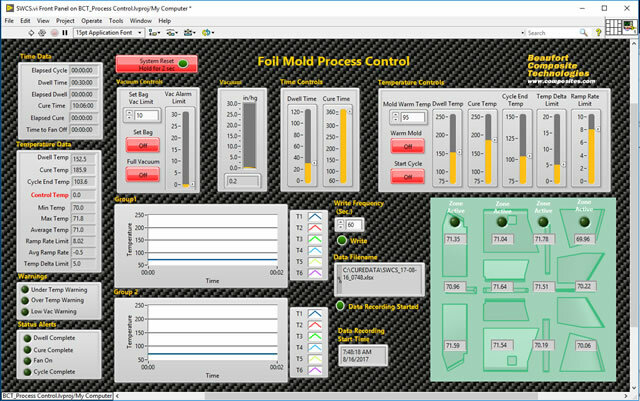 The app then can be run stand-alone on a tablet or laptop to control a mold. 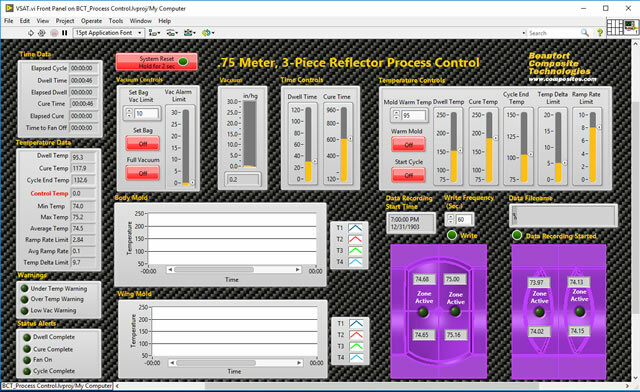 The software is primarily used to control BCT's computer controlled, heated molds and oven, but over the years, has been used to control and measure numerous other things. Beaufort Composite Technologies has considerable experience in the design, analysis and engineering of composite structures and their required tooling. In today's world, the assets required for these capabilities are all computer based and BCT is fully equipped with the optimal computer program for a particular field and the skill to use them. BCT focuses on the processing of epoxy prepreg laminations. Molded parts have their machine cut plys kitted and then are hand laminated in the mold. One-off molds are created for prototypes or when only a few parts are required. They are generally machined as females. Small and high precision one-off molds are machined from epoxy tooling block. 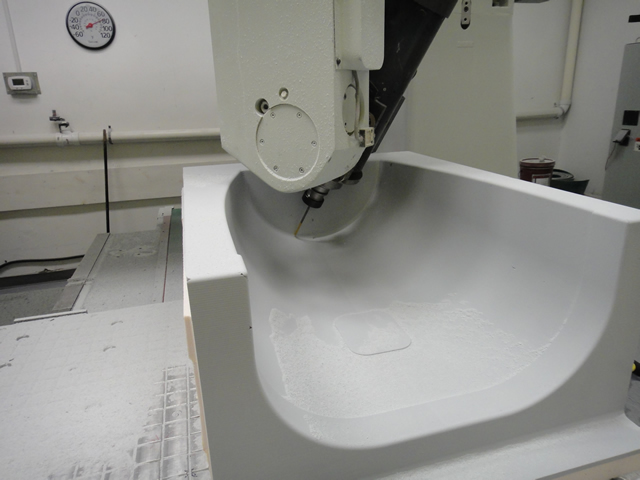 Larger molds are created by machining PU foam, extruding modeling paste and then machining the mold's net shape. Parts are directly laid up in these molds. Masters are required for the manufacture of production tooling for traditional molds as well as BCT's Computer Controled Heated Molds. Masters are CNC machined on BCT's 5-axis router. Once the machining has been completed, they are wet sanded, sealed and released. Small and/or high precision masters are machined from epoxy tooling block, where larger masters are manufactured using the foam/paste technique. Production molds are made off a previously machined and finished master. BCT only manufactures epoxy prepreg molds, both carbon and e-glass. Tooling prepreg is used that has an initial cure of between 120 and 140F. Using intial low-temp curing prepregs, minimizes shape distortion created by the thermal expansion of the master when curing in the oven. Once the mold surface has been cured, pre-manufactured stiffening sections are bonded to it and then it is postcured. Mold surfaces are a graphite filled, high-temp, epoxy surface coat. These molds are used in an oven or autoclave and can cycle at temperatures up to 400F. Over the past twenty years, BCT has developed, refined and has used in the production of finished parts; its proprietary, computer controlled, heated mold technologies. Beyond developing specialized techniques in the mold's actual construction, BCT has developed its own data acquisition and control programs that control and record the entire curing process. To make a composite prepreg part requires a mold and there are three basic types of molds that BCT produces. 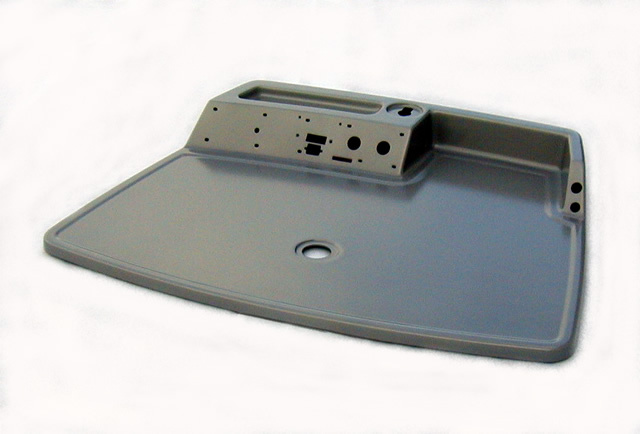 One-off and prototype parts are generally molded in one-off molds, which have been machined as females. 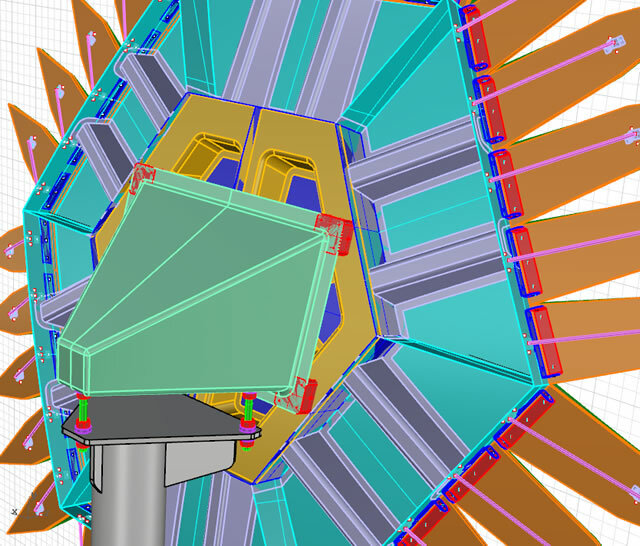 All efforts are made to keep the tooling costs minimized, reducing the cost of the part itself. Often one-off projects are large structures, where its mold might be machined in multiple parts and then bonded together. Limited production parts are produced from molded tooling and where only limited number of parts or set of parts are required for a given time period. To match the thermal expansion of the finished part; carbon molds are used for carbon parts and E-glass molds are used for E-glass parts. These parts are cured in a oven. When BCT produces production parts, it utilizes its heated mold technology to gain maximum efficiencies. Frequently production projects also require machining and/or assembly fixtures that BCT also produces for the program. Most production parts require assembly and finishing. KA band Reflector - Approximately 400 mfg. Laser Eye Surgery Table - Approximately 600 mfg. Medical equipment Console - Approximately 600 mfg. Pedal Steel Guitar Component sets - Approximately 150 mfg. BCT produces epoxy prepreg, complex shaped, molded parts manufactured from dedicated tooling, whether be it one-off or production. Layers or plys are hand laminated against the mold and are then cured under vacuum in BCT's oven or in a BCT heated mold. Molded parts generally incur some post operations in terms of trimming and drilling of holes, assembly, surface finishing and painting. BCT manufactures composite cored panels using various core materials, solid laminate sheets, and tooling boards to customer laminate specifications. One-piece panels are pressed at 4' x 32' and then cut into the customer's optimal sheet size without custom pricing! Custom laminate schedules according to customer specified requirements. The customer specifies ply materials and fiber orientation (0, 90, +45, -45, etc.) providing almost infinite permutations. Panels are laminated to yield 4 feet by 32 feet, from which the customer specifies its cutting. Panels are cured under 28 inches hg and at 250F using BCT's proprietary computer controlled heated vacuum press. Standard panels have a tg of 250F. Peel ply finish for secondary bonding. 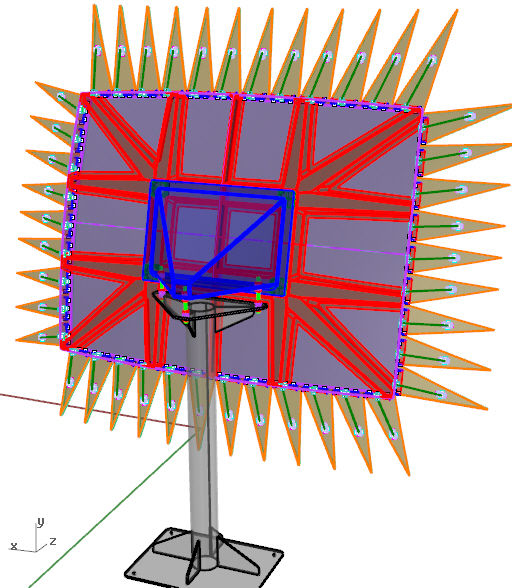 Complex CNC cutting and milling of panel when CAD files are provided by the customer.